When you’re just starting out with commercial drone work in Canada, there are a lot of directives to pay attention to in order to stay in compliance with regulations. One of the crucial steps to take in order to keep you flying safe is to send in proper notification 24-48 hours prior to your commercial UAV flights to NavCanada. If a Notice to Airmen (NOTAM) is required, then a NavCanada rep will file one on your behalf. The latest template (as of June 2018) can be downloaded here. It has been recently updated to include details on the spotter, UAV platform and other items. 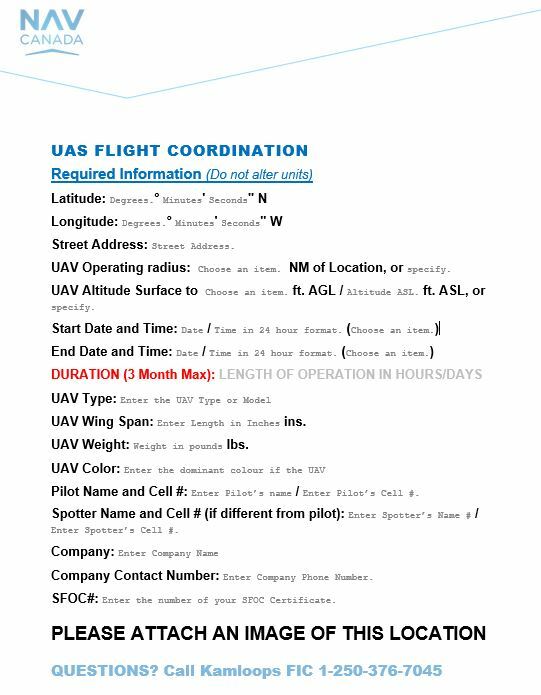 The completed form can be sent to UAV_VR@navcanada.ca. Remember to check the local frequencies, have an aeronautical radio on site and have procedures in place in case of unexpected occurrences during flight. A good gauge of a competent UAV pilot is how he or she deals with challenging and unexpected situation, not how they fly when everything is functioning properly. All the best in your future drone operations!